it looks a little like Psocoptera but the size does not fit. As far as I know Psocoptera are 3-5 (-10) mm in size and this one was larger. Unfortunately I have no exact size but by comparing it to the bark it was rather 10-15 mm. 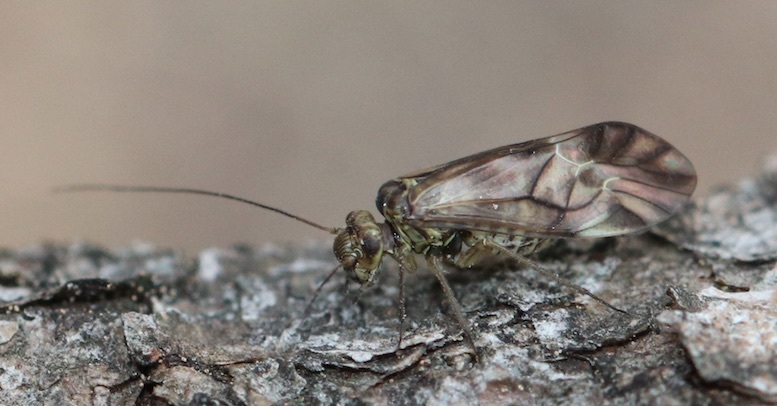 The biggest european Psocoptera, Psococerastis gibbosa reaches a wing span up to 16 mm and a body length of 7-7.5 mm. I agree. So my size estimate was mistaken. Thanks for the link. My best guess from this list would be Metylophorus nebulosus. Correct? Sorry you suggested Metylophorus nebulosus. So I agree.